We travel along the N2 towards Sir Lowry’s Pass where you can have a spectacular view of False Bay. The focal point or “heart” of the Cape Whale Coast is the popular seaside resort of Hermanus, just a mere 2 hour drive south of Cape Town. It’s considered by many to be the “Best Land Based Whale Watching Spot In The World” where you can watch the Southern Right Whales basking in the waters of Hermanus. It is a beautiful town chosen by many living abroad as their second home. 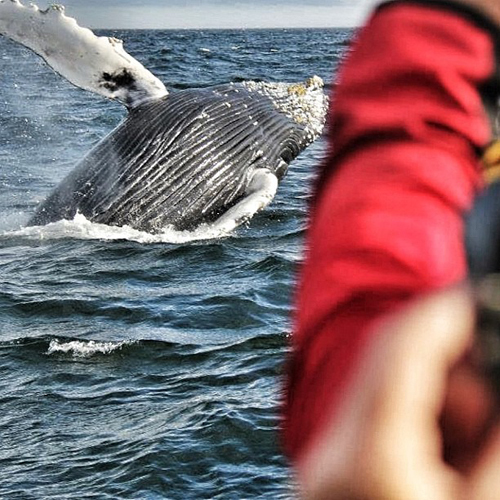 We will endeavor to let you see the giants from the sea, you will however, have the option at your cost to take a boat trip to see the whales at sea. We visit the endangered African penguins at Stoney Point and if time permits we visit the Harold Porter Botanical gardens before we return back to Cape Town via scenic Clarence drive. We would love to hear from you. We are happy to help you with all your tours and information about tours that you might require. We are even able to tailor make a tour just for you, depending on what the attractions are that you would like to see. Please dont hesitate to contact us!